Destall of ‘Different Approaches’, now on to the next one! 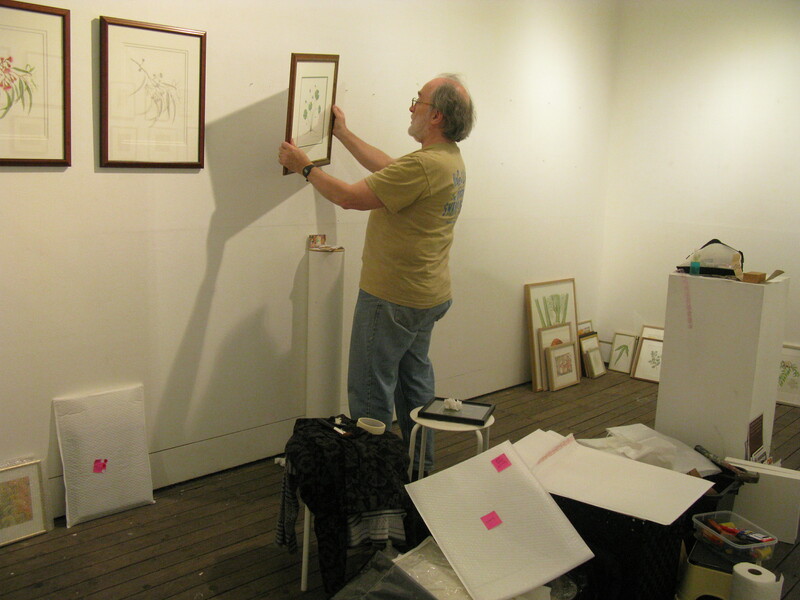 Monday 6 July 2015 was the last day of my joint exhibition with fellow artist, Michael Hogan, of our Different Approaches: A Retrospective exhibition at Gaffa Gallery in the Sydney CBD. Gaffa is a great place to exhibit and a really interesting venue all round so thanks very much to Gallery Manager, Liz McCrystal and all the other staff there who helped along the way, and thanks also to all those people who braved the cold Sydney weather over the last couple of weeks to have a look at our work. I ended up selling 10 framed and 4 unframed works so really pleased with that! Artists exhibiting at Gaffa do all there own installation and destallation so yesterday it was the turn of Michael and me to take down all our works and repair the Gallery 2 walls in readiness for the next lot of artists coming in today to install their exhibition. Quite a job so thanks very much to my husband, Jamie McIlwraith, for helping me with doing this yesterday and also for all his support in the lead up to the exhibition. 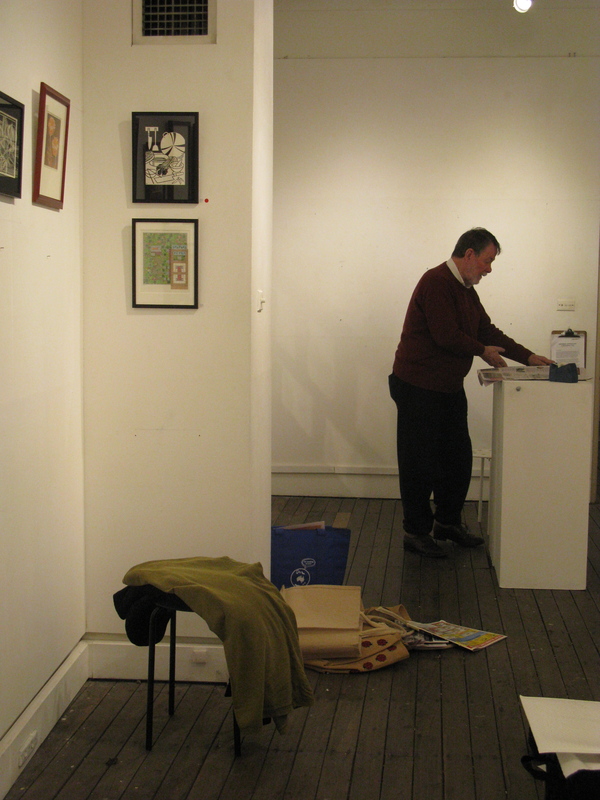 Here’s Jamie helping to remove some of my artwork from the walls for packaging up for purchasers, or to take back home, and below is Michael organising some of his work. But there’s no rest for the wicked, over the last few months I have also been working on various ideas for another joint exhibition, LIQUID LIFE, and now that the aforementioned one with Michael at Gaffa is finished, I will be able to seriously get into doing some new work for this one. The theme of this joint exhibition with my cousin and fellow Central Coast artist, Tracey Scheitel, is anything at all relating to water, whether it be water plants or creatures, how we use water, the sea and other waterways, and a myriad of other sources so no shortage of areas to draw inspiration from. This exhibition which will be opening on Tuesday 1 September 2015 at the Shorethyme Restaurant/Gallery at Norah Head on the NSW Central Coast and I will be updating details about this and blogging on my progress over the next couple of months. HI Pam How are you going ? I haven’t heard from you for a while. I am frantically churning out paintings, how about you? I just wanted to make sure that you send any correspondence to this address not my work email. Also I have found a place up here that can print the flyers quite cheaply.